Python package to build custom applications involving solving PDEs by the Finite Element Method (FEM). This tutorial focuses on the first way and introduces the basic concepts and nomenclature used in the following parts of the documentation. Check also the Primer which focuses on a particular problem in detail. Users not familiar with the finite element method should start with the Notes on solving PDEs by the Finite Element Method. This section introduces the basics of running SfePy from the command line. The script simple.py is the most basic starting point in SfePy. It can be invoked in many (similar) ways which depends on used OS, Python distribution and SfePy build method (see Installing SfePy for further info). All (working) alternatives described below are interchangeable, so don’t panic and feel free to pick your preferred choice (see Basic Usage for further explanation and more usage examples). Please note, that improper mixing of in-place and install builds on single command line may result in strange runtime errors. All functions of SfePy package can be also used interactively (see Interactive Example: Linear Elasticity for instance). We recommend to use the IPython interactive shell for the best fluent user experience. You can customize your IPython startup profile as described in Using IPython. The simplest way of using SfePy is to solve a system of PDEs defined in a problem description file , also referred to as input file . In such a file, the problem is described using several keywords that allow one to define the equations, variables, finite element approximations, solvers and solution domain and subdomains (see Problem Description File for a full list of those keywords). The syntax of the problem description file is very simple yet powerful, as the file itself is just a regular Python module that can be normally imported – no special parsing is necessary. The keywords mentioned above are regular Python variables (usually of the dict type) with special names. explain the elements of the file on several examples. A top-level script (usually simple.py as in this tutorial) reads in an input file. Following the contents of the input file, a Problem instance is created – this is the input file coming to life. Let us call the instance problem . The Problem instance sets up its domain, regions (various sub-domains), fields (the FE approximations), the equations and the solvers. The equations determine the materials and variables in use – only those are fully instantiated, so the input file can safely contain definitions of items that are not used actually. The solution is then obtained by calling problem.solve() function, which in turn calls a top-level time-stepping solver. In each step, problem.time_update() is called to setup boundary conditions, material parameters and other potentially time-dependent data. The problem.save_state() is called at the end of each time step to save the results. This holds also for stationary problems with a single “time step”. So that is it – using the code a black-box PDE solver shields the user from having to create the Problem instance by hand. But note that this is possible, and often necessary when the flexibility of the default solvers is not enough. At the end of the tutorial an example demonstrating the interactive creation of the Problem instance is shown, see Interactive Example: Linear Elasticity. Now let us continue with running a simulation. The following commands should be run in the top-level directory of the SfePy source tree after compiling the C extension files. See Installation for full installation instructions. Download examples/diffusion/poisson_short_syntax.py. It represents our sample SfePy Problem Description File, which defines the problem to be solved in terms SfePy can understand. Use the downloaded file in place of <problem_description_file.py> and run simple.py as described above. The successful execution of the command creates output file cylinder.vtk in the SfePy top-level directory. The postproc.py script can be used for quick postprocessing and visualization of the SfePy output files. It requires mayavi installed on your system. the right mouse button controls the zoom. Here we discuss the contents of the examples/diffusion/poisson_short_syntax.py problem description file. For additional examples, see the problem description files in the examples/ directory of SfePy. where is a subset of the domain boundary. For simplicity, we set , but we still work with the material constant even though it has no influence on the solution in this case. We also assume zero fluxes over , i.e. there. 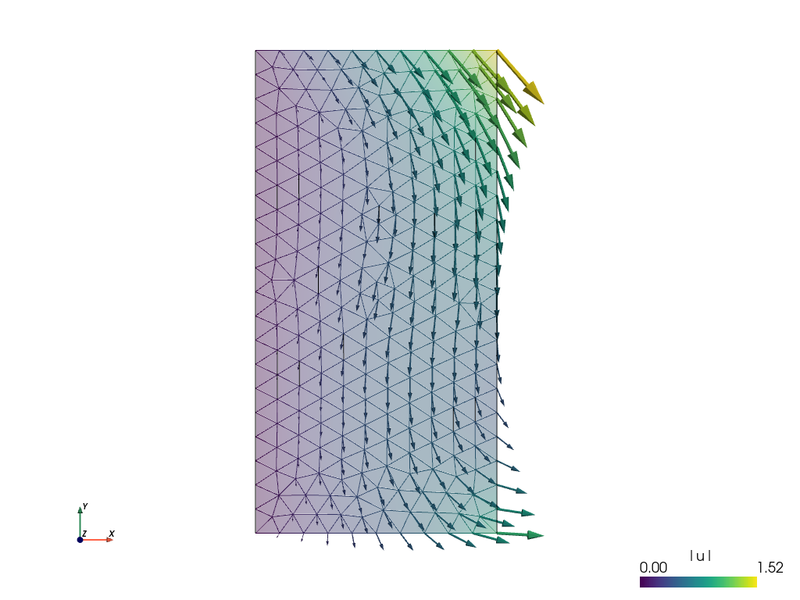 The particular boundary conditions used below are on the left side of the cylindrical domain depicted in the previous section and on the right side. Comparing the above integral term with the long table in Term Overview, we can see that SfePy contains this term under name dw_laplace . We are now ready to proceed to the actual problem definition. Open the examples/diffusion/poisson_short_syntax.py file in your favorite text editor. Note that the file is a regular Python source code. The filename_mesh variable points to the file containing the mesh for the particular problem. SfePy supports a variety of mesh formats. Here we define just a constant coefficient of the Poisson equation, using the ‘values’ attribute. Other possible attribute is ‘function’ for material coefficients computed/obtained at runtime. 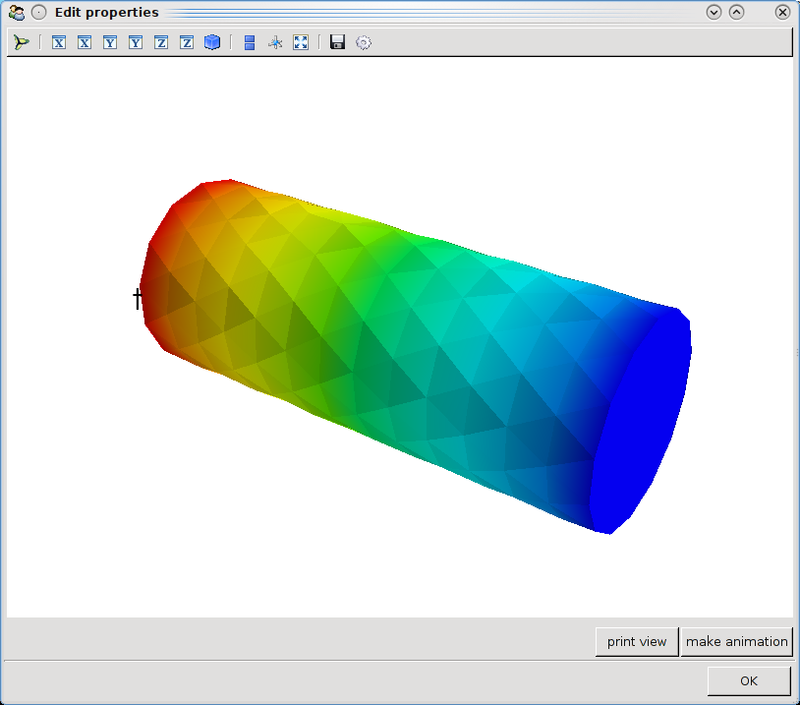 Many finite element problems require the definition of material parameters. These can be handled in SfePy with material variables which associate the material parameters with the corresponding region of the mesh. Regions assign names to various parts of the finite element mesh. The region names can later be referred to, for example when specifying portions of the mesh to apply boundary conditions to. Regions can be specified in a variety of ways, including by element or by node. Here, ‘Omega’ is the elemental domain over which the PDE is solved and ‘Gamma_Left’ and ‘Gamma_Right’ define surfaces upon which the boundary conditions will be applied. A field is used mainly to define the approximation on a (sub)domain, i.e. to define the discrete spaces , where we seek the solution. The Poisson equation can be used to compute e.g. a temperature distribution, so let us call our field ‘temperature’ . On the region ‘Omega’ it will be approximated using linear finite elements. A field in a given region defines the finite element approximation. Several variables can use the same field, see below. One field can be used to generate discrete degrees of freedom (DOFs) of several variables. 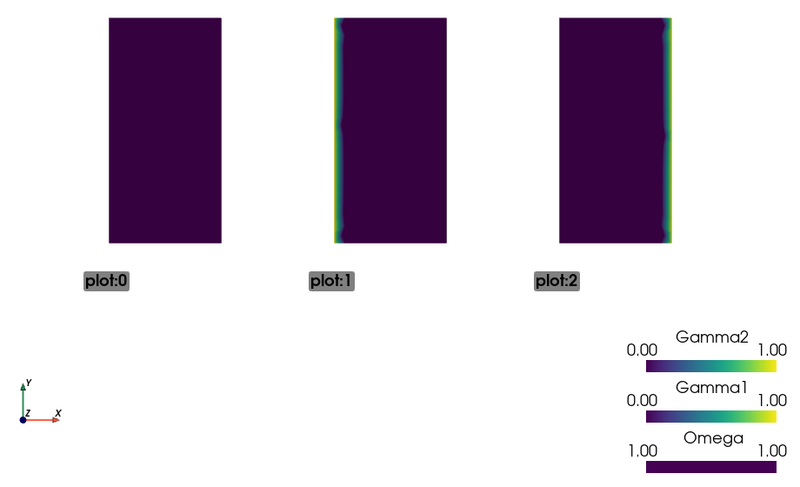 Here the unknown variable (the temperature) is called ‘t’ , it’s associated DOF name is ‘t.0’ – this will be referred to in the Dirichlet boundary section ( ebc ). The corresponding test variable of the weak formulation is called ‘s’ . Notice that the ‘dual’ item of a test variable must specify the unknown it corresponds to. For each unknown (or state) variable there has to be a test (or virtual) variable defined, as usual in weak formulation of PDEs. Essential (Dirichlet) boundary conditions can be specified as above. Boundary conditions place restrictions on the finite element formulation and create a unique solution to the problem. Here, we specify that a temperature of +2 is applied to the left surface of the mesh and a temperature of -2 is applied to the right surface. Integrals specify which numerical scheme to use. Here we are using a 2nd order quadrature over a 3 dimensional space. The equations block is the heart of the SfePy problem description file. Here, we are specifying that the Laplacian of the temperature (in the weak formulation) is 0, where coef.val is a material constant. We are using the ‘i’ integral defined previously, over the domain specified by the region ‘Omega’ . 'Temperature' : """dw_laplace.2.Omega( coef.val, s, t ) = 0"""
The integration order is specified directly in place of the integral name. The integral definition is superfluous in this case. Here, we specify the linear and nonlinear solver kinds and options. See sfepy.solvers.ls, sfepy.solvers.nls and sfepy.solvers.ts_solvers for available solvers and their parameters.. Even linear problems are solved by a nonlinear solver (KISS rule) – only one iteration is needed and the final residual is obtained for free. Note that we do not need to define a time-stepping solver here - the problem is stationary and the default 'ts.stationary' solver is created automatically. The solvers to use are specified in the options block. We can define multiple solvers with different convergence parameters. That’s it! Now it is possible to proceed as described in Invoking SfePy from the Command Line. This example shows how to use SfePy interactively, but also how to make a custom simulation script. We will use IPython interactive shell which allows more flexible and intuitive work (but you can use standard Python shell as well). where the stress is defined as , , are the Lamé’s constants, the strain is and are volume forces. This can be written in general form as , where in our case . where is the test function, and both , belong to a suitable function space. Hint: Whenever you create a new object (e.g. a Mesh instance, see below), try to print it using the print statement – it will give you insight about the object internals. The whole example summarized in a script is available below in Complete Example as a Script. Read a finite element mesh, that defines the domain . Create a domain. The domain allows defining regions or subdomains. Define the regions – the whole domain , where the solution is sought, and , , where the boundary conditions will be applied. As the domain is rectangular, we first get a bounding box to get correct bounds for selecting the boundary edges. 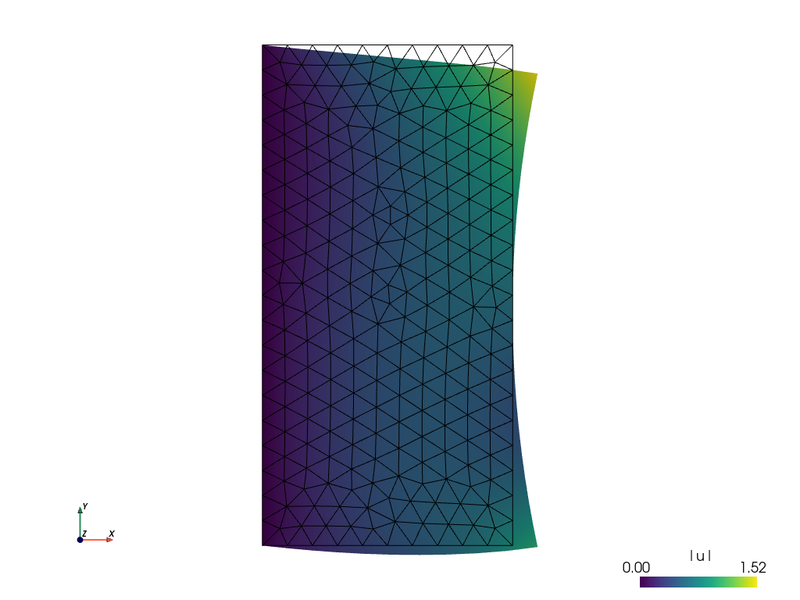 Next we define the actual finite element approximation using the Field class. Using the field fu , we can define both the unknown variable and the test variable . Before we can define the terms to build the equation of linear elasticity, we have to create also the materials, i.e. define the (constitutive) parameters. The linear elastic material m will be defined using the two Lamé constants , . The volume forces will be defined also as a material as a constant (column) vector . One more thing needs to be defined – the numerical quadrature that will be used to integrate each term over its domain. Now we are ready to define the two terms and build the equations. The equations have to be completed by boundary conditions. Let us clamp the left edge , and shift the right edge in the direction a bit, depending on the coordinate. The last thing to define before building the problem are the solvers. Here we just use a sparse direct SciPy solver and the SfePy Newton solver with default parameters. We also wish to store the convergence statistics of the Newton solver. As the problem is linear it should converge in one iteration. Now we are ready to create a Problem instance. The Problem has several handy methods for debugging. Let us try saving the regions into a VTK file. Finally, we set the boundary conditions and the top-level solver , solve the problem, save and view the results. For stationary problems, the top-level solver needs not to be a time-stepping solver - when a nonlinear solver is set instead, the default 'ts.stationary' time-stepping solver is created automatically. See the docstring of view() and play with its options. This file should be run from the top-level SfePy source directory so it can find the mesh file correctly. Please note that the provided example script may differ from above tutorial in some minor details.